G8JCFSDR "Using a Shaft Encoder for Tuning"
The G8JCFSDR may be tuned using a Shaft Encoder for that "proper tuning knob" feel. (Serial interface only). Get hold of a shaft encoder - I use the Alps P/N EC16B36104 available from http://rswww.com No. 265-1723 for about EUR 4-00; which has 24 pulses per revolution, and is very reasonably priced, and widely available - whichever shaft encoder you get, make sure that it has NO indents or detents. The 0.001uF debounce capacitors off terminals A & B are not critical and any value between 0.01uF and 0.001uF may be tried out. If you find that the direction of tuning is reversed, simply swap over the A and B connections. The pin numbering shown in the diagram is for a 9 pin serial connector. If you have a 25 pin D-Type, then CTS is on pin 5, and DSR is on pin 6. The circuit should work with most PCs, however for proper RS232 compliance one should really attach the common pin, ie "C" to -5V, so that the CTS and DSR signals swing at least +5V to -5V (+12 to -12V) would be even better, but as I said, every PC RS232 i/f I've tried works fine with just 0 & 5V. If you do wire "C" to -5V change the resistors to 22K, and if you use +12V & -12V, then change the resistors to 47K or 56K, the current thru. the encoder switches should be kept below 0.5mA. The shaft encoder pulses are read into the PC using the CTS & DSR RS232c inputs. If your serial i/f to the DRT1 has pins 1&3, 4&6, 7&8 joined, you may experience strange behaviours including the SDR apparently locking up. If you have the joined pin problem you cannot implement shaft encoder tuning unless you cut the join between the pins. On builds below 42, you may also experience strange behaviour if you have the joined pins problem even if you don't have a shaft encoder attached. On build 42 and above the default setting is NO Shaft Encoder; enable Shaft Encoder in the Config. panel. 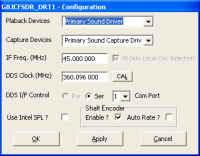 The Shaft Encoder tuning software employs an accelerating algorithm. At low turn rates, the frequency is adjusted in 1 Hz steps per pulse, ie 24 Hz per revolution, as the rotational speed is increased the tuning rate increases to 10Hz, then 100Hz and finally 1KHz (if you can spin it fast enough ! ).